Death is a tricky subject. 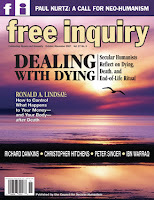 I talk about talking about it in the current issue of Free Inquiry. I look forward to reading this issue, which contains about a dozen articles about dying. Plus articles by Peter Singer, Christopher Hitchens, and Richard Dawkins.